If you happen to be the proud owner of a Chevy Sonic and are also looking to augment your zippy subcompact with a palpable performance upgrade, then GM’s Turbo Stage Kit with High Flow Exhaust should be on your short list. Designed and engineered by GM/Chevrolet Performance, the bundle of the low-restriction exhaust and appropriate engine calibration software adds 10 horsepower and 15 pound-feet over the standard setup, for a total of up to 148 horsepower and 163 pound-feet of torque. And that’s not to mention the improved audible qualities furnished by the exhaust. Available for both the Chevy Sonic Sedan and 5-door Hatch, the kit includes the exhaust system, calibration software, premium fuel label and new 50 state legal emissions certification label. 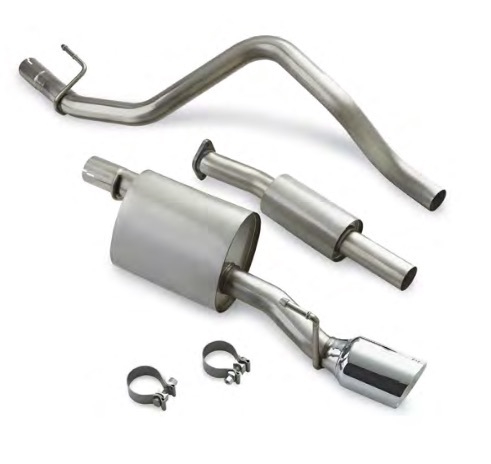 The exhaust hardware itself costs $600, plus any dealer installation charges. The kit keeps the vehicle’s original warranty intact. The Turbo Stage Kit with High Flow Exhaust is available as an official Performance Part from the Chevrolet Performance Parts catalog. Alternatively, the kit is also available to order with the 2016 Chevy Sonic as an LPO (dealer-installed) feature from the factory. Can you put that on the Cruze? I would like to see more performance parts available on more hm models, especially on more Chevys. It’d be awesome if it worked for the Cruze too, you’d think it would since it’s the same exact powertrain, and if anything there would be more room for the stuff on the Cruze, but it’s GM, they can’t even design their infotainment systems to accept meaningful software updates. I’m also wondering what GM dealerships will charge to do just the software update? My Cruze is out of the bumper to bumper, and they wanted to charge me $150 to hook my car up to there system to check for a MyLink update, and $150 to apply the MyLink update, if there was even one available. If there was none available, I’d still be out $150 just for wanting to check if an update was available. Needless to say I don’t go to that Chevy Dealership anymore.lol Good to see that GM is releasing stuff like this though, something to make up for the lack of performance variants for their passenger cars, which is a nice gesture. Even in this car 10% is not much. I wish GM would more Turbo Upgrade kits like the Cobalt SS/ HHR SS and Solstice kit. This added around 55 HP and boosted the torque from 250-260 to 315-340 foot pounds. I fully expect the upgrade for the coming Camaro. It only took a flash and two Maps on mine. It cost about the same as this exhaust. While this is a start they could do much better. Note the only down side is I have to use premium only but I was any how as if you don’t it cost you around 20 HP stock. But if you are wanting 23 PSI boost you have to give it the fuel. You can get most tune shops to make a flash but you always are taking a risk if something goes wrong. Does this mean that it is for manual transmission Sonics only? The performance gains seem nice, but having to use premium fuel makes it not worth it to me. Also, I doubt the “improved audible qualities furnished by the exhaust” …I’m fully expecting loud and buzzy. Is the turbo stage kit with high flow exhaust only available for the manual shift transmission? Or can it be used on the 2014 Sonic RS with 6 speed automatic transmission? I always seen the foot note of needing up upgraded clutch for the manual transmission vehicles. While I Understand Your Want, the Cruze should be on your Want list. It contains a more powerful engine, a more refined suspension than the sonic, and doesn’t feel as cheap. I own a 2014 1.8L Chevy Sonic LT, and the engine just makes it seem like it wants to die. It runs as it should, its just not made for anything more then casual driving. There’s no such thing as spirited driving in this vehicle. Sure, you can buy a tune by trifecta, and an Air INTAKE by K&N, and add the High Flow exhaust, but after the cost of all of that, you’d be better off buying a new Cruze. It’s engine is different for the 2016, and 2017 Model year, Produces almost 20HP more, and you have more choice for added options in the cabin and exterior. The Cruze RS hatchback has the same engine as the Sonic RS hatchback, same displacement, just turned up the boost. I’m probably going to another manufacturer who provides more horsepower per displacement than the Cruze or Sonic, and better mpg and sound system. Plus no intrusive “ON STAR”! Yes. Cruze has it too. If you get the exhaust then opt for the GM performance intake. I have it on my sonic RS and it makes a world of difference. I also added the exhaust and intake to an RS in our showroom. It looks and sounds good. We’ve had a lot of action on the car too. Here in my little country Belgium i bought the 1200cc version as the 1400cc or 1800cc weren’t there yet. Now i’m wondering if it’s possible to put a turbo on my 1200cc version engine? I AM asking the same Question ..I Plan to Buy a 2019 Chevy Sonic RS TURBO With 6 SPD AUTOMATIC,I WANT TO ADD THE PERFORMANCE PKGE …CAN THIS BE ORDERED AT GM DEALER? Not likely,turbo upgrades and 4wheel disk brakes have been reserved for Chevy Sonic up to 2016 model only, so there goes nothing. And since the Sonic line is probably about to get axed,the factory backed performance goes right out the window also. Looks like the mighty little 1.4L turbo engine is gonna be the garden variety engine across the board at GM, leaving enthusiast’s wishing for more from the beloved lil Sonic.